Concord, New Hampshire – On May 1, 2019 over three hundred business professionals will gather for NHBSR's 18th annual Spring Conference, We Are the Change, to celebrate and connect on ways that businesses are leading sustainability efforts in the state. As the preeminent event on Corporate Social Responsibility in New Hampshire, this year's conference will feature an impressive lineup of thought leaders and trail blazers who are the driving forces behind businesses making a positive impact on our world. Conference participants will come away inspired and equipped with tools and resources to help them further their own sustainability goals. New Hampshire Businesses for Social Responsibility Slam attendees determine winners at the 4th Annual Just One Thing Sustainability Slam. NHBSR Announces 2018 Just One Thing Sustainabilty Slam Presenting Finalists: Learn from the Most Creative and Exciting Sustainability Stories of Our Time at an Event you Won't Want to Miss!! Concord, New Hampshire, October 18, 2018 ­­– Leading sustainability initiatives will take front and center stage at New Hampshire Business for Social Responsibility's 4th Annual Sustainability Slam. This event, which takes place at LaBelle Winery in Amherst, NH on November 1, 2018 from 5:00-8:00 PM creates a platform where the most creative and innovative solutions to our environmental and social challenges are brought to life in dynamic 90-second story sound bites. Dee Fitzgerald of W.S. Badger, a returning company sponsor of the event, enthuses, "The Slam format is so unique and different, it's a fabulous and validating way to bring people together to not only meet, mingle, and network, but to share inspirational stories." CONCORD, NH – On May 2, 2018 New Hampshire Businesses for Social Responsibility announced the 2018 Cornerstone and Partnership for Innovation Award winners at their 17th Annual Spring Conference, Lead the Change. Winners of the prestigious Cornerstone and Partnership for Innovation Award were chosen for their exemplary efforts to promote the concepts of Corporate Social Responsibility (CSR) within the greater business community of New Hampshire. New Hampshire Businesses for Social Responsibility’s Annual Spring Conference is a chance for individuals and organizations across the state to network with each other and share insights and best practices key to pivoting New Hampshire forward in sustainability. For the 17th year in a row, NHBSR has provided an important platform for cross-sector engagement and collaboration, inviting students and universities, government agency and non-profit professionals, and business leaders from varied industries across New England for an "all hands on deck" approach to sustainability. New Hampshire Businesses for Social Responsibility’s Cornerstone and Partnership for Innovation Awards will be presented on May 2, 2018 at Grappone Conference Center as part of NHBSR’s 17th Annual Spring Conference, Lead the Change. Winners of the Cornerstone and Partnership for Innovation Award finalists are chosen for their exemplary efforts to promote the concepts of Corporate Social Responsibility (CSR) within the greater business community of New Hampshire. Concord, New Hampshire – On May 2, 2018 at Grappone Conference Center in Concord, NH, Leith Sharp, Director of Executive Education for Sustainability Leadership at Harvard University’s Center for Health and the Global Environment, will be keynoting New Hampshire Businesses for Social Responsibility 17th Annual Spring Conference, Lead the Change. New Hampshire Businesses for Social Responsibility will present their 3rd annual Sustainability Slam, on November 2nd at LaBelle Winery in Amherst. As evidenced at the last two years’ events—it will be a dynamic evening of storytelling, where some of the state’s leading businesses bring their sustainability stories to life through fast-paced presentations that focus on content, brevity (think 90 seconds) and most importantly, FUN! The Sustainability Slam is part of NHBSR’s Just One Thing campaign designed to recognize businesses and organizations for their environmental, community and workplace initiatives, while encouraging more businesses to get involved with Just One Thing. All it takes is just one thing to make a difference in your organization’s sustainability efforts. New Hampshire Businesses for Social Responsibility announced today the finalists for NHBSR’s Cornerstone and Partnership for Innovation Awards. The 2017 finalists are CCA for Social Good of Manchester, Cirtronics of Milford, Coca-Cola Bottling Company NNE of Bedford, ReVision Energy of Exeter and W.S. Badger of Gilsum. New Hampshire Businesses for Social Responsibility (NHBSR) is pleased to welcome Chris Rooney of Pax World Investments and Jessica Kinsey of Cirtronics, to the organization’s board of directors. New Hampshire Businesses for Social Responsibility (NHBSR) is pleased to welcome Lisa Drake of Stonyfield and Melissa Skarupa of Dartmouth-Hitchcock, to the organization’s board of directors. New Hampshire Businesses for Social Responsibility’s Spring Conference keynote, Simon Mainwaring, CEO of We First, an international brand leadership consultancy, presented the business case for purposeful storytelling. Mainwaring detailed how changes in our culture, marketing and consumerism require businesses and organizations to clearly understand and communicate their purpose. Those who do, demonstrate a clear advantage in generating a profit. NHBSR’s conference, A Story Worth Sharing, the Chapters of Your Sustainability Journey explored the latest in sustainability through a story lens. From the keynote address, to panels of sustainability leaders representing all sized businesses, attendees gained actionable ideas through storytelling and shared experience. 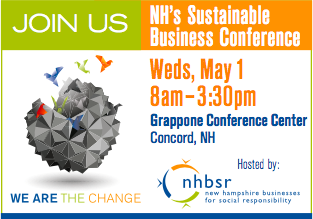 The Future of Sustainability Storytelling Concord, New Hampshire, March 15, 2016 – Simon Mainwaring, CEO and Founder of We First Branding, will provide the keynote address, "The Future of Sustainability Storytelling" at New Hampshire Businesses for Social Responsibility’s Spring Conference on May 10th at the Grappone Conference Center in Concord. Mainwaring’s keynote will focus on how the marketplace is being reshaped daily by shifts in culture, technology and demographics. Growing expectations from consumers are placing greater sustainability demands on marketers who are already struggling to keep pace with changes in technology, channels and stakeholder engagement. Meanwhile there is a greater need than ever for organizations to serve as positive change agents to address the compounding environmental crises that our world faces. Concord, NH – New Hampshire Businesses for Social Responsibility announced today three finalists for the organization’s highest honor, the Cornerstone Award. The three finalists are ReVision Energy of Exeter, Post Landfill Action Network of Lee, and Hypertherm and Casella (a collaborative project), of Hanover and Rutland, VT, respectively. The Cornerstone Award is presented annually to an individual, organization, or company exemplifying the concepts of corporate responsibility within their organization and the greater business community in the state of New Hampshire. The winner will be announced and the award presented by Governor Maggie Hassan (invited) at NHBSR’s annual conference on Tuesday, May 10th in Concord. Applicants are judged on their Corporate Social Responsibility (CSR) practices within their workplace/organization, the ways in which they encourage others to engage in sustainability, and promote the value of CSR within the New Hampshire business community. New Hampshire Businesses for Social Responsibility (NHBSR) is pleased to recognize W.S. Badger Company as the winner of the 2013 Cornerstone Award. Governor Maggie Hassan and 2012 Cornerstone winner Tom Strickland of Sequoya Technologies Group presented the award on May 21 at NHBSR’s conference at the Grappone Conference Center in Concord. New Hampshire is home to many innovative and successful companies – but from an employee’s perspective, what are the best companies to work for? NH Businesses for Social Responsibility (NHBSR) and Business NH Magazine are singling out the companies whose employees love their jobs, have great benefits, are treated fairly and take pride in the work they do. The top ten large and small companies to work for will be celebrated at the Breakfast With The Best event on February 13 in Manchester. New Hampshire Businesses for Social Responsibility (NHBSR) is making it convenient – and fun – for sustainably-minded businesses in the Keene area to connect with one another. Residents of the Monadnock region will have the chance to enjoy great food, new connections, and inspiring conversation at NHBSR’s next Member Social on February 6 in Keene. The host for this event is the Courtyard by Marriott in downtown Keene, and attendees can tour their new LEED-certified, NH Environmental Champion hotel! NHBSR is making it convenient – and fun – for sustainably-minded businesses to connect with one another. NHBSR’s member socials allow New Hampshire professionals to connect with one another and learn about sustainability initiatives throughout the state. Previously held annually, NHBSR’s member socials will now be held quarterly, thanks to support from Small Dog Electronics, an NHBSR member. A holiday social is scheduled for 12/5/12. Additional sponsors of the holiday social are NHBSR members Monadnock Paper Mills, Checkmate Workforce Solutions, and ReVision Energy. Union Leader, 11/03/12 by Gretyl Macalaster Sustainability has become more than a buzzword as businesses realize its value, both to their bottom line and in how they are viewed by consumers. Executive Director Molly Hodgson Smith announced today that she is leaving her leadership role at New Hampshire Businesses for Social Responsibility (NHBSR). New Hampshire Businesses for Social Responsibility (NHBSR) is proud to announce the launch of their 2011 Sustainability Webinar Series. Annual Governorâ€™s Conference on Volunteerism: Volunteers Make It Happen. Stakeholder communications firm to provide brand, integrated marketing, public relations and community relationsâ€™ services for growing community savings bank. Monadnock Paper Mills, Inc, manufacturer of technical speciaility and premium printing and packaging papers, has received the New Hampshire Governor's Award for Pollution Prevention. On Saturday, October 28th C&S Associates volunteered their time as part of "National Make a Difference Day"